Munich - While Germany were busy making light work of Brazil on Tuesday, FC Schalke 04 were continuing their preparations ahead of the 2014/15 Bundesliga campaign. 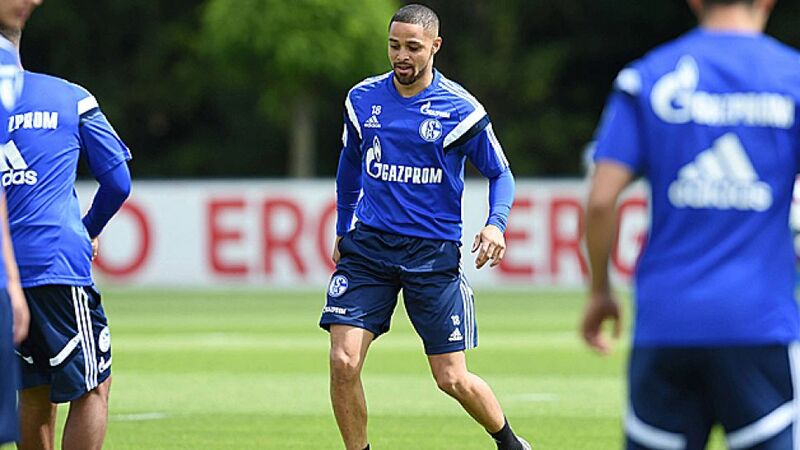 One of the Royal Blues’ latest recruits, Sidney Sam, scored his first goal for the club in their pre-season victory over TuS Hordel last week and the 26-year-old is hoping to continue in a similar vein when the new season gets underway. bundesliga.com: Sidney Sam, after four years at Bayer 04 Leverkusen you’ve now joined FC Schalke 04. What are your expectations and objectives at your new club? Sidnay Sam: I’ve settled in well and definitely want to achieve great things here. We want to finish in the top three and get at least as far in the UEFA Champions League as we did last season. If Bayern or Dortmund slip up, we want to take advantage. bundesliga.com: When you confirmed your departure, Schalke were still behind die Werkself in the table. Now, Schalke have already clinched their place in the Champions League, while Leverkusen still have to play a qualifier. Has everything gone according to plan? Sam: When you look at it that way, it has. But irrespective of whether Schalke had qualified for the Champions League, I made the conscious decision to join Schalke and would have had no issues playing in the Europa League. I’m delighted that Schalke finished in the top three of course, but I wish Leverkusen all the best. It’d be good for German football if a fourth team qualified for the group stages. bundesliga.com: What are your first impressions of Schalke and your new surroundings? Is everything on a slightly bigger scale compared to Leverkusen? Sam: Definitely. I noticed that at my first meeting with the fans. The stadium is also enormous. bundesliga.com: What has impressed you or surprised you the most? Sam: Everything really. The team, the coaching staff, the medical department. Everything’s great! The club is run perfectly. bundesliga.com: What does coach Jens Keller expect of you this term and has he told you where you’re going to play? Sam: He expects as much as I do of myself. He knows what I can do and thinks I can help the team develop. bundesliga.com Competition is very high in Schalke’s midfield in particular. How confident are you of competing with Julian Draxler, Kevin-Prince Boateng, Max Meyer, Leon Goretzka and Co. and becoming a first-team regular? Sam: Competition for places is always good, every player benefits from it and that’s the way it should be. It’s the way you improve and I’m looking forward to it. bundesliga.com: Last season you arguably had the best first season-half of your career, but then you suffered an injury and were left out of Germany’s World Cup squad. How did you cope with those setbacks? Sam: At the start I was very disappointed that the injury cost me my place at the World Cup, but I never give up and always believe in myself. I'll continue to give my all in training and in matches. bundesliga.com: The World Cup final takes place on Sunday. How do you rate Germany’s chances? Sam: The lads’ football was out of this world. Every shot seemed to go in, but nobody’s getting carried away after that result - they’re sensible and are keeping their feet firmly on the ground. The 7-1 counts for nothing in the final and they know they’ll have to pull out all the stops. Anything could happen.